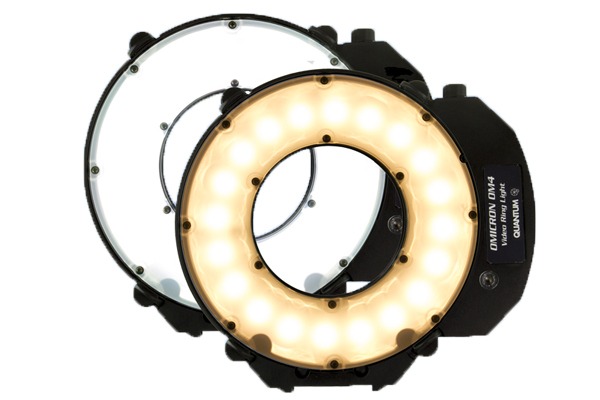 Quantum Instruments has announced another new LED ring light, the bi-colour Omicron OM4. Unlike the hybrid Omicron QF26 and OM3, which can work in both flash and continuous modes, the new OM4 model is a dedicated video lamp putting out constant light only. A “video auto-tracking” feature allows the brightness to adjust automatically to match the ambient conditions. According to the manufacturer, the Omicron 4 has “more power” than their other ring lights and has a 60° beam spread. The OM4 is also said to be “chromatically correct” — Quantum’s marketing term for their method of adding coloured diodes in the array to compensate for the unnatural colour casts and incomplete spectrum of light typically generated by LEDs. Users can select the output brightness (0–100%) or colour temperature (2500–6500K) by an LED display, which can also be used to create up to eight preset colour and power configurations for quick recall later. The Omicron can be powered from the wall, from a Quantum battery or a V-mount battery using different adapters. The price is $689 in the US from Amazon , Adorama, B&H Photo and other dealers. For further information, visit the Quantum Instruments product page or watch the (slightly eccentric) promotional video below.